You won’t find a better electric chainsaw. It will surprise you with its power. The Makita UC4030A is officially discontinued and has been replaced by the Makita UC4051A. I’ll get into the improvements later in this article. Either way, this is a very impressive electric chainsaw that’s been evolving since 2008. It truly is a work of genius as to how they managed to create such a powerful and effective corded electric chainsaw. It rivals a small gas chainsaw in terms of cutting power. If you decide to purchase a Makita UC4030A / UC4051A I guarantee that you’ll be surprised at its cutting power. With an electric chainsaw you don’t have to deal with maintenance, noise or the smell of gas. I’ll also discuss the Makita UC3530A (discontinued), which has been updated to the Makita UC3551A. The UC3551A is identical to the Makita UC4030A chainsaw except that it has a 14″ bar and chain — other than that, it’s identical. This is a thorough review of the Makita UC4030A and UC3530A, with plenty of images, video and detailed information. This chainsaw deserves your consideration because it’s absolutely brilliant — it truly is an exceptional electric chainsaw. You can cut firewood all day long with this chainsaw. Don’t worry, if you came here looking for information on the discontinued Makita UC4030A because it’s been replaced by a new and improved model — the Makita UC4051A. The original UC4030A was originally released to consumers in 2008 and both of the models (14″ and 16″) have found a passionate audience.Why? Well, these are extremely well-made chainsaws that endure over time. These are professional grade chainsaws, and when you hold one in your hands, you’ll feel the quality. In other words, a high percentage of customers rate the Makita UC4030A / UC4051A and the UC3530A / UC3551A at or above 90% in terms of quality and satisfaction. It really is that good. In previous articles I considered these Makita chainsaws as “Best Buy” chainsaws, and with the updated models, they continue to be high on my list of recommended chainsaws. To avoid any confusion I just want you to know that anything I say about the Makita UC4051A in this article is also true for the UC3551A — except for the bar and chain size. Other than that, these electric chainsaws are identical twins. Before we get into the details of the Makita UC4051A and the UC3551A, here’s some information about Makita, the company. The fact that the Makita UC4051A electric chainsaws has been on the market for over 7 years is also a strong indicator of quality and dependability. One of the great benefits of buying a chainsaw that’s been on the market for several years is that Makita has had the opportunity to tweak and refine the overall design and performance as problems arise — in the same way that car manufacturers improve their car models year after year — Makita has done the same with the UC4051A and the UC3551A. One of the things I look for when buying an expensive product is the reputation of the company that makes the product. Today, new companies come around and try to sell you their product with slick video demonstrations and a feature list but no history to back up their claims. I don’t like buying first generation products for this reason. Unfortunately, the only way to test the quality of a product is to use it in the real world— not in a laboratory. When buying a new power tool the best indicator of quality and longevity is in using it for your projects. The second best indicator of quality is in researching the experiences of customers; which, strangely enough, gives you more accurate data. An average of 100 people is far more informative than only having your own empirical evidence. Makita has been creating innovative tools for over 100 years. The bottom line is that the majority of owners of the Makita UC4030A / UC4051A and the UC3530A / UC3551A are extremely happy with their chainsaw, but more importantly, they feel that their money was well spent. How do you know if the new chainsaw model you’re considering will stand the test of time? How do you know if it’s reliable and will continue to perform? How do you know if a chainsaw will be safe to use and remain durable? (in this case, the Makita UC4030A (UC4051A) and the UC3530A (UC3551A) How do you know if they’re any good over the long-term? Simple! Because there’s an abundance of data to back it up. People have been using various iterations of the Makita UC4030A / UC4051A for over 7 years and the data says that it’s a reliable, powerful, well-engineered and comfortable electric chainsaw. In 1915, Makita began its long and prosperous journey as a humble repair shop in Nagoya, Japan. Originally registered as Makita Electric Works, they began their business by selling and repairing motors, transformers and lighting equipment. World War I was taking place and, as you can imagine, it was a time of great upheaval. Eventually, the company shifted its focus and took the initiative to manufacture their own electric generators and motors which led them down a path of innovation and prosperity. The tool-free adjuster has been updated on both models. If you’ve never owned a Makita tool before, well, shame on you…just kidding. Actually, Makita is known for its build-quality and advanced motor design. The company has an extraordinary ability to execute and deliver professional tools with a strong integration of ergonomics coupled with ease of use for consumers. Makita has high standards when it comes to testing all of the components that go into a tool, and of course the integration of the final tool itself and how it operates under load and stress. The Makita UC4051A is one of the most reliable chainsaws on the market, and the overall engineering of the chainsaw is on par with Husqvarna and STIHL, which are incidentally, the two largest, and well-known chainsaw manufacturers in the world. Learn more about the history of Makita by reading their historical timeline. Sorry for all of the gushing and high praise but it’s well-deserved and I want my readers to know it. There are many mediocre and crappy tools on the market, and sadly too many people waste their money on bad tools because they’re inexpensive to buy — and that bothers me. My philosophy is to spend a little extra money (if you need to) for a tool that will be far more dependable, comfortable, effective and safe to use. NOTE: The Makita UC4030A has been discontinued and updated to the new and improved Makita UC4051A. Although, at the time of this writing you can still buy the Makita UC4030A on Amazon — but at some point, it won’t be for sale. Don’t waste your money on disposable power tools — especially chainsaws because they’re dangerous if haphazardly designed. The last thing you want to do is put your health at risk by buying a poorly constructed chainsaw. What’s your life worth? Price alone shouldn’t be your determining factor on how to spend your money. If you want a decent inexpensive chainsaw then I suggest you visit this section: Cheap Chainsaws. The Makita UC3551A (14”) and the Makita UC4051A (16”) are both powered by an innovative and powerful 15-Amp Makita-built motor for superior performance. Model differences. They’re subtle but noticeable. The first thing you’ll notice when you start cutting is how much power the chainsaw generates. You’ll question if its even a corded electric even though you’ll be staring right at the cord. In fact, the Makita UC4051A has comparable cutting power with a gas chainsaw of the equivalent size. It’s true. Makita has managed to optimize the power generated from the 15-Amp motor. It’s a proprietary Makita motor so you won’t find it in other brands but clearly all the years of developing their own technology has really paid off in their tools. Yes, there are other 15-Amp electric chainsaws on the market but they don’t compare with these Makita models. Comfortable grip feels solid in your hands. For example, I recently wrote an article on the WORX WG303.1 (14.5 Amp) and WG304.1 (15-Amp) but they’re not in the same league as the Makita UC4051A. I’m not discounting WORX or their products, they actually make great consumer-grade chainsaws but their chainsaws are inferior to these Makita chainsaws. They simply don’t have the heft, ergonomics, build-quality or cutting power of either of these Makita electric chainsaws; they’re good but the Makita UC4051A is great. Read about WORX Chainsaws and see how it compares to these Makita chainsaws. Even though the WORX WG304.1 has the same amperage, it’s not comparable in terms of cutting effectiveness. Why? Because the quality of Makita components are far superior as well as the overall engineering of the entire chainsaw as a system. You can feel the difference when you hold them in your hands and compare them. The Makita chainsaws are double the price of the WORX chainsaws and they’re worth the extra cost. There are a lot of inexpensive chainsaws on the market which are consumer-grade. The Makita UC4051A is a professional-grade electric chainsaw. Having said that, it’s not a logging saw, nor is it designed for heavy-duty cutting but my point being is that the overall build quality is very high — surpassing the quality of WORX and other cheaper chainsaws. You get what you pay for. Extension Cord | What Gauge? One thing that is absolutely essential with these corded electric chainsaws is that you use the correct extension cord. At the end of this article I outline the best extension cords for you but I’ll mention it here as well. You need to use a 12 gauge extension cord with these chainsaws. No exception. You can use a 10 gauge extension cord as well, but DO NOT USE anything higher than a 12 gauge — either 12 or 10-gauge. No exceptions! Some people will argue that a 14 or 16 gauge is okay, but it’s not. Most people don’t understand how extension cords work. The wrong cord will force your chainsaw to run hotter and reduce the current powering it, which will reduce performance and put a strain on the components. Either way, make sure you buy the appropriate extension cord. See my picks at the end of the article. Learn more about extension cords by reading: Buying the Right Extension Cord. Thankfully, the Makita UC4051A has a built-in current limiter that will reduce the power to the motor if the chainsaw is overloaded. I wish more chainsaws had this feature. This is a very practical mechanism that will protect your investment. A sign of quality. The large oil reservoir with view window allows operator to check the bar oil level, and the automatic chain oiler is designed for heavy continuous cutting. The rubberized grip handles are designed for comfortable operation, while the large trigger switch with soft start is designed for smooth start-ups. The UC3551A (14”) and Makita UC4051A (16”) are both double insulated, and are well-suited for a wide range of cutting applications, such as: Pruning, trimming, limbing, firewood cutting and felling trees up to 14 inches. Both models include a chain, guide bar and scabbard (chain cover), and of course, the chainsaw. Made with high quality components. Worth your hard-earned money. If you haven’t figured it out yet, I’m a big fan of the Makita UC4051A — and I generally don’t like corded tools but in this case things are different. Why? Because most corded chainsaws lack power which makes the cord one extra thing to wrestle with and worry about, but the Makita UC4051A is an exception because it actually cuts like a gas chainsaw of the equivalent size, which means you get all the benefits of an electric chainsaw without sacrificing power; and because of that, it’s an exceptional electric chainsaw. 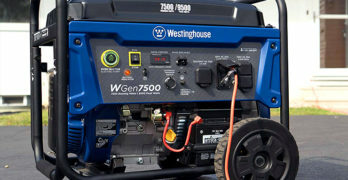 Because it’s electric you don’t have to inhale gas fumes, it’s much quieter, you won’t disrupt your neighbors, it’s cheap to operate and it’s lighter than a gas chainsaw, weighing just under 14 pounds. Honestly, you can’t go wrong with this chainsaw. It’s one of the few perfect chainsaws available for homeowners. And, the advantage it has over a battery-powered chainsaw is that you don’t have to worry about running out of battery and you can run it all day if you need to. You get the best of both worlds and it feels fantastic when you hold it in your hands. It’s comfortable. You can tell that it’s been engineered to last. The only negative I have to point out about the design of the Makita UC4051A is the fact that it doesn’t have anti-vibration technology integrated into the chainsaw. I wish that Makita would have added that as part of the feature-set. It’s unfortunate that they didn’t include anti-vibration handles, but because it’s a medium-duty saw it’s not as essential as it would be on a gas chainsaw, where you’d be exposed to higher vibrations. Because of the lack of anti-vibration I would definitely recommend buying anti-vibration gloves when using this Makita chainsaw. There are many to choose from and they’re inexpensive. Learn more about why anti-vibration gloves are worth the money. Makita engineered these corded electric chainsaws with comfort and ease-of-use. Tightening and adjusting your chain is as simple as can be. All you do is turn the chain tensioner knob clockwise when the chain requires tightening. Straight from the manual, which I recommend you download and read. For increased stability when cutting Makita has added large metal bucking spikes to provide you with a safe pivot on wood for steady cutting. This is an easy to use electric chainsaw. Makita has done a great job of making everything accessible and intuitive to use, which includes starting the saw, easy to use chain adjuster, checking and adding fluids is straightforward, and checking the spark plug and air filter is as easy as can be expected. Overall, the Makita UC4030A / UC4051A is one of the best electric chainsaws you can buy and although it’s more expensive than the average electric chainsaw it’s actually worth the extra cost because of the excellent build quality and the cutting power that it generates. I recommend either of these Makita chainsaws over any gas chainsaw for the average consumer. Of course, if you’re going to be doing some heavy-duty cutting then I recommend a gas chainsaw like the Husqvarna 455 Rancher, but most homeowners don’t need a heavy-duty chainsaw. Automatic and manual chain brake engagement. Note: When the chain brake is activated the power supply to the motor will be instantly cut off. How Does the Current Limiter Work? This electronic component prevents too abrupt starting of the electric motor. When the electrical current to the saw exceeds the permissible level, the power supply to the motor is automatically cut off, preventing overheating of the motor and potential damage. View or download the MANUAL for the Makita UC4051A chainsaw. View or download the PRODUCT INFO for the Makita UC4051A chainsaw. View or download the MANUAL for the Makita UC4030A chainsaw. View or download the FLYER for the Makita UC4030A chainsaw. Read the original PRESS RELEASE for the Makita UC4030A from May 6, 2008. Powerful 15 Amp Motor: High performance for professional cutting. Tool-less Blade & Chain Adjustment: No need for wrenches, simply turn a lever. Helps protect motor from burn-out. Reduces power to the motor when saw is overloaded. Rubberized Grip Handles: Ergonomically designed for comfort & safe handling. Work longer with less fatigue. Automatic chain oiling mechanism: Enables heavy-duty continuous cutting. Electric Chain Brake: Quick stops for maximum productivity. Double Insulated: Superior operator protection. OREGON S56 — the right replacement chain for your Makita UC4030A. Amazing quality but slightly smaller with its 14″ bar and chain. The changes are minor, but important. Also, the newer model is significantly cheaper. The tool-less adjuster has a new design. As I’ve been saying throughout this article the Makita UC3551A has all of the great features as Makita UC4051A except that it has a smaller bar and chain — 14″ to be precise. It’s a little less expensive and weighs a little less as a result. Other than that, everything remains the same. Ultimately you get decide which one is best for your needs. If most of the wood you’ll be cutting is on the smaller size then the Makita UC3551A will suffice. Perfect for cutting wood under 14″ in diameter. Sure it can handle larger trees and branches but if the wood is too thick it will bog down, so I recommend buying this model for cutting wood under 14″ — but under 12″ is the ideal target diameter for this chainsaw. Side view of the new updated model UC3551A. One-touch tool-free blade and chain adjustment. Rubberized grip handles are comfortable to hold. Large trigger switch with soft start for smoother starting. Built-in current limiter will protect your motor from burnout if saw is overloaded. Large oil reservoir with translucent view window. The best electric chainsaw you can buy. These chainsaws have been on the market for over seven years now. Makita continues to update them because they are extremely popular with customers. These chainsaws are made for people who appreciate quality and want to invest their money in a chainsaw that will still run strong in a few years. These aren’t cheap chainsaw, but you do get what you pay for — professional-grade electric chainsaws. If you read this article then you already know what I think but I’ll reiterate it again. If you value your money and you need a good quality chainsaw for light to medium-cutting duties then either the Makita UC3530A / UC3551A or the Makita UC4030A / UC4051A are exactly what you need. Yes, they’re more expensive than other electric chainsaws but they’re also far superior and will actually last you longer, not to mention they’re more versatile because they can handle larger projects allowing you the freedom to handle all of your wood cutting needs around the home. The Makita UC4051A will be able to handle larger trees and wood as it has a 16″ bar and chain, which might come in handy for future projects. As long as you don’t mind managing an extension cord, this might be the best chainsaw for around the home. All of the components are top notch and that’s what you’re paying for — superior parts. More metal, thicker plastic, better engineering, more effective transmission of power, proper ergonomics. If you value quality then I can’t say enough good things about it. Buying the right extension cord is essential when using corded electric power tools. The Makita UC4030A and the Makita UC3551A are 15-Amp electric chainsaws and in order to run them properly you need to buy a 12-gauge extension cord. If you want to understand the reasons why, then read the article entitled: Buying the Right Extension Cord. All of your questions will likely be answered. If you use the wrong extension cord the chainsaw won’t run properly. It will be sluggish, run hot and an improper extension cord can also shorten the lifespan of your corded electric chainsaw, or any other power tool. Do I have your attention yet? I hope so. Here are my 4 extension cord recommendations for the Makita UC4030A . Buy one of these and you’ll be running your Makita 15-Amp chainsaw with optimal power and protection. Safety equipment is always essential when using a chainsaw and also knowing proper safety operating procedures should always be first and foremost on your mind when working. We’ve written extensively about safety at Chainsaw Journal so I’ll just direct you to the most pertinent articles related to chainsaw gear that you should be wearing before you fire up your chainsaw. When does your chain need sharpening? Sawdust from sawing humid wood looks like wood flour. Your saw chain requires a lot of pressure to cut the wood. The chain cutting edge is visibly damaged. Chainsaw is pulled to the left or the right when cutting. This is caused by uneven Sharpening of the chain or by damage to one side. Note: Sharpen frequently, but without removing too much metal! Generally, 2-3 strokes of the fie will be enough. You might be interested in reading: How to Sharpen A Chainsaw. Learn more about Makita. It’s an interesting video that shows you their commitment to developing high quality tools.